Americans jealously guard the social safety net—Social Security, unemployment insurance, minimum wage laws and workplace health/safety standards. But few know how these came to be. 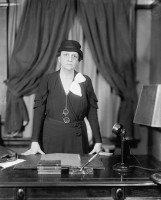 Frances Perkins, the first female Cabinet member, blazed that trail. When newly-elected President Franklin Delano Roosevelt (FDR) met with her February 22, 1933, Perkins knew what he would ask. She had known him since 1910. As governor, he picked her to lead the New York State Industrial Commission, where she strengthened worker safety and implemented unemployment insurance, a hotly debated idea. He also admired her command of employment statistics, especially when she disputed President Hoover’s 1930 assertion that the Depression was almost over. The first year of Roosevelt’s presidency focused on getting people back to work, through such programs as the Civilian Conservation Corps, in which Perkins played a major role. She built a reputation for resolving labor-management disputes and nurtured relationships with FDR’s intimates, including his wife Eleanor. She then pressed forward. “I took it upon myself to mention unemployment insurance at least every second meeting of the Cabinet – just to mention it so that it wouldn’t . . . get out of people’s minds.” The depression provided an opportunity she was determined to seize. “It is probably our only chance in 25 years” to get a bill through Congress dealing with both [unemployment insurance and old-age pensions],” she told FDR. Roosevelt backed unemployment compensation but, facing business opposition, publicly wavered. A furious Perkins marched to the White House. The next day he backed off and even encouraged a more comprehensive approach. She confronted a constitutional question: would the Supreme Court uphold social insurance mandated by the federal government? She identified the “swing” justices and approached them. At a party, she confided to Justice Harlan Stone her worries that unemployment and old-age insurance might not pass constitutional muster. He could not officially comment yet gave her crucial advice, ‘The taxing power, my dear, the taxing power.” So, rather than the “dole,” which FDR hated, people and businesses would be taxed, with the money set aside for unemployment insurance and Social Security. Near the end of December, with the committee locked in disagreement and its deadline looming, she locked the members in her home, put a bottle of Scotch on the table and kept them at it until 2 a.m. They produced a unanimous report. As the bill went through Congress, she accepted amendments. Getting a law passed which could be modified was better than no law at all. When it became clear that old-age insurance was popular but unemployment insurance was controversial, she flipped their positions in the bill to put the more acceptable measure first. A formidable and dedicated public servant, Perkins led the way for many more women to follow.